Decorative embossing technique. In Japanese prints, it is also sometimes called 'blind printing'. 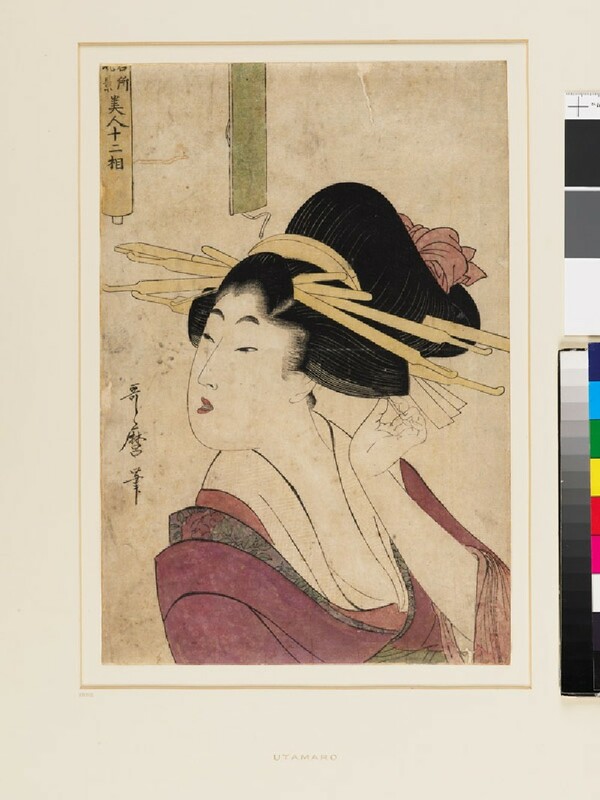 A Courtesan is looking slightly upwards to her right with a pin in her left hand to scratch her hair. The title of the series written in the top-left corner is on a partly unrolled scroll in which there is no inscription, as there had been in earlier versions of this series. This print was partly re-coloured by hand as the print had faded. For instance, the outer kimono was originally red and white with asanoha-kanoko (spotted hemp leaf pattern), the middle kimono was stronger in colour with a different design and the obi was yellow. This version is, however, aesthetically more pleasing with an elegant summery mood, and the design of peony is nicely combined with the reddish and pinkish colours. The white under-garment of the kimono is embossed in gauffrage and has a sayagata (geometric) motif, beautifully done. Many parts of this print have been re-touched by hand.